Scitec Nutrition Zero Sugar/Zero Fat ISO Great is a 100% Cross-flow microfiltered Whey Isolate protein with no lactose and cholesterol and provides highest protein per serving. Gives nothing but purest form of whey protein with highest possible protein percentage per serving. Additionally it has Zero Carb and Zero Fat, meaning no lactose (milk sugar) and Cholesterol. Enhanced with L- Glutamine for recovery and L- Arginine for improved vascularity. Processed by using a low temperature and pressure combination of cross- flow microfiltration technique that provides all the essential amino acids and biologically active protein microfractions important for immunity. 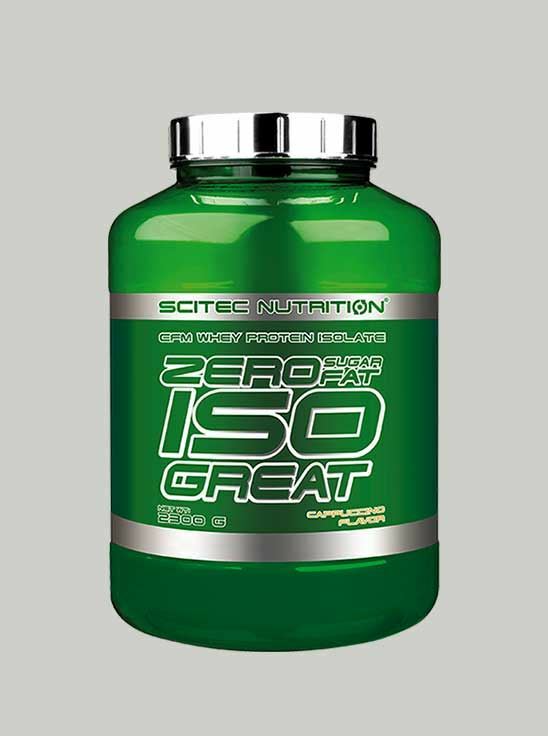 Zero Sugar/Zero Fat ISO Great is a fast-acting protein and the body digests it within 30 minutes of consumption. Protein Requirement for a sedentary individual is 0.8-1g/kg body weight. However for an exercising individual the requirement increases upto 1.5-2g/kg body weight depending on activity levels. Use a serving with 250 ml of any liquid to make a shake. Additional servings can be consumed. This is not a meal replacement product, use only as a food supplement. 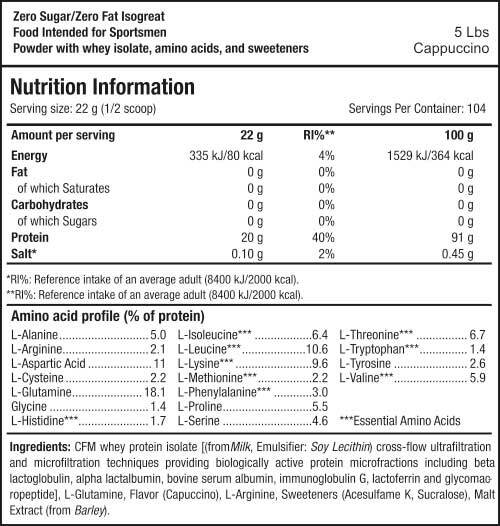 Whey is a milk protein extract. Milk protein is made up of two types – casein protein and whey protein. The water which remains after cheese making process is known as sweet dairy whey. Whey protein has all 22 amino acids & all 8 essential amino acids. Whey Protein is highly bioavailable and is superior to egg protein. Q.2 What is ZERO CARB/ ZERO FAT ISOGREAT? Q.3 What is Whey Protein Isolate? It is the purest form of whey protein available. It contains 90% or more protein. Whey isolates are fat-free, are very low in carbs, and are lactose free Whey Protein Isolate has a higher percentage of proteins which rounds to almost 80-90%. Higher concentration of protein is the result of the processing it undergoes i.e. either Cross Flow Micro-filtration and Ion- Exchange. These processes help to separate protein from lactose, fats, ash and minerals. Whey Isolate has minimum amount of lactose, fats, ash and minerals in comparison to whey Protein Concentrates Whey Protein Isolate is a fast –acting protein and the body digests it within 30 minutes of consumption, the property to digest fast helps to repair damaged muscle tissue and aids in faster recovery Whey Isolates have much lower amount of lactose than Whey concentrates, thus a great choice for lactose sensitive individuals. Q.4 Is whey protein Veg? Yes, it is derived from milk. Q.5 If I am eating chicken, fish, egg do I still need to consume whey protein? Pure proteins form almost 80 percent of the macronutrient category of supplements. The reason for this is one of the biggest advantages of supplementation is the convenience with which one can have superior quality nutrients. In terms of inclusion into a sports nutrition diet the most challenging and logistically impractical task is to get the right quantum of first class proteins into every meal, every day. Pure protein powders and meal replacements, ready to drink protein drinks, protein bars formulated with whey, casein and egg albumin make this challenging task extremely easy and convenient. It is the protein powder category of supplements that makes sports nutrition possible for the average fitness enthusiast and competitive athlete. Q.6 Is whey protein easy to digest? Yes, it is very easy to digest. Q.7 How many times in a day we should consume whey? The ideal times to consume whey protein are first thing in the morning and post-workout, so as to stop catabolism (breakdown of muscle) and kickstart anabolism (muscle synthesis). Apart from this whey can also be consumed with/in-between meals to meet up daily protein requirement. Q.8 Can we get same amount of protein through milk/diet? Here’s a simple illustration of quantity of different protein foods you will have to eat to get same amount protein from one scoop of Whey. Q.9 Does whey causes weight gain? Whey protein helps in muscle gain by repairing the torn muscle tissue and increasing its size (hypertrophy). Thus, the weight gain seen will be in form of muscle gain and not fat gain. Higher muscle mass will lead to increase in BMR and therefore increase fat burning as well.